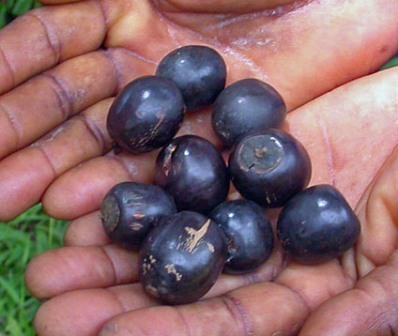 Other names: Black plum, West African plum. Plem is an African fruit. This is widespread in tropical West Africa and then extending eastwards to Uganda, Kenya and Tanzania. This species if found growing in coastal woodlands and savannah, at low altitudes in wetter areas and in upland grasslands upto an altitude of 1500 m.
This fruit is widely used by various communities in Africa for many purposes including wine and jam. 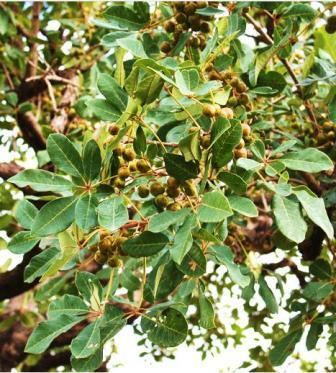 Small to medium deciduous tree, upto 25 m tall; bole branchless upto 11 m, 90-160 cm in diameter, often slightly fluted at the base; bark surface grayish white to pale grayish brown, fissured and scaly, inner bark yellowish white, darkening to brown; young branches shortly hairy, glabrescent. Leaves opposite, digitately compound with (3–)5(–7) leaflets; stipules absent; petiole 5–20 cm long; petiolules up to 2.5 cm long; leaflets obovate to elliptical, 4–25 cm × 2.5–10.5 cm, notched to rounded or shortly acuminate at apex, entire, leathery, nearly glabrous. Inflorescence an axillary cyme up to 10 cm long and 16 cm wide, orange-brown hairy; peduncle 2–7.5 cm long; bracts up to 6 mm long; flowers bisexual, zygomorphic, 5-merous; pedicel up to 2 mm long; calyx conical, 3–5 mm long, with short teeth, enlarging in fruit; corolla white to pale purple, tube 6–8 mm long, curved, limb 4-lobed, lobes c. 3 mm long and middle lower lobe up to 4.5 mm long; stamens 4, inserted in the corolla tube, 2 long and 2 short; ovary superior, obovoid, 4-celled, style c. 7 mm long. Fruit san obovoid to oblong-ellipsoid drupe 2-3 cm long, purplish black, fleshy, with woody, 4-celled stone. Seeds upto 4, without endosperm. The fruits are sweet and are eaten raw. It tastes like prune. The fruits are collected and eaten by children. However, these are also eaten by all when there is a shortage of food. In certain areas, the fruits are also cooked before consumption. The fruits are a good source of Vitamin C containing 18.1 g of it in 100 g of pulp. 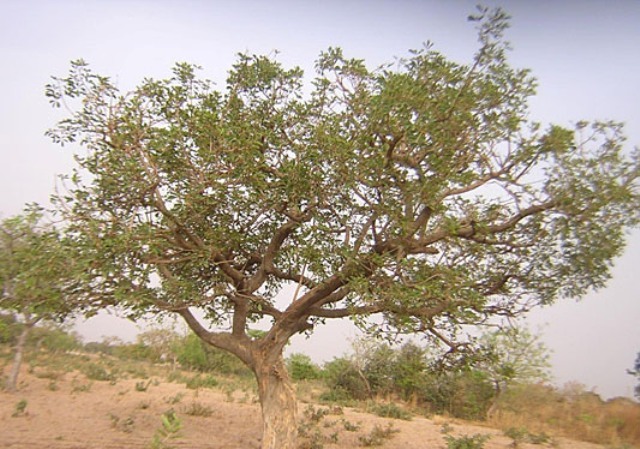 Numerous medicinal uses plem are reported in literature in Africa. It can be used to treat used to treat anemia. The root is used to treat gonorrhoea. 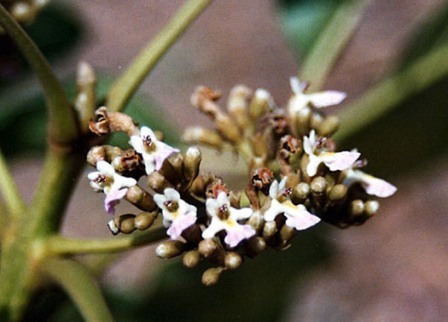 It is also supposed to improve fertility and is used to treat jaundice, leprosy, and dysentery. The tree produces teak like timber which is said to be resistant to termites. The tree regenerates naturally by seed and natural suckers. The seeds take long to germinate. It is therefore better to collect natural suckers for getting new plants.